For more than 35 years, we've provided our customers with innovative sensor technologies and dependable engineering consulting expertise. If you have a need for a precision TDR that can be used in the field, we're the source. If you need help solving a complex problem, we're the folks for that too. High-Resolution TDR with Frequency-Domain Analysis! The CT100B* TDR Cable Analyzer is the industry's highest-resolution portable TDR, ideal for precision testing of all types of coaxial, twisted-pair, and multiconductor cables and connectors. The CT100B is the only metallic cable TDR with frequency-domain analysis tools including Return Loss (S11), Cable Loss (S21), and Smith charts. 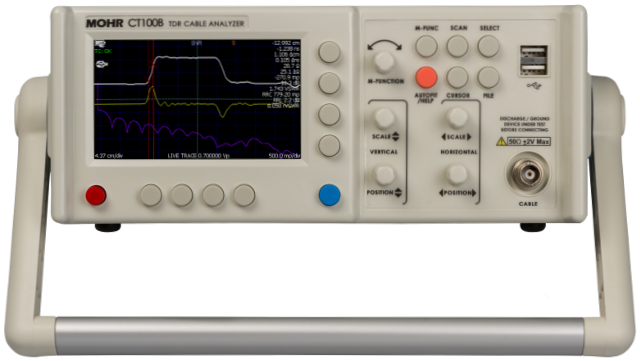 The CT100B is the only portable instrument exceeding all TDR performance specifications of the popular Tektronix® 1502, 1502B, and 1502C TDRs. See comparison. 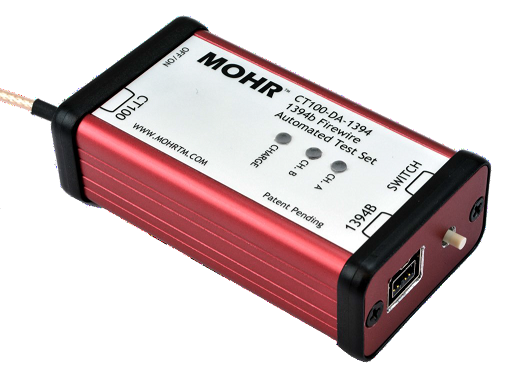 *CT100B and CT100HF are the latest models in the CT100-series of TDRs from MOHR. **CT100HF is a higher performing laboratory instrument than the CT100B, but its electronic circuitry is more sensitive to electrical overload. Click here for more information about MOHR TDRs. The CT100-DA-1394 Firewire Adapter is designed to speed up testing of IEEE-1394b cables. It performs accurate differential impedance measurements using MOHR's single-ended TDR. It has a mini-USB connection to a CT100B for software controlled switching between the two pairs of conductors, as well as a push-button for manually toggling the connection. 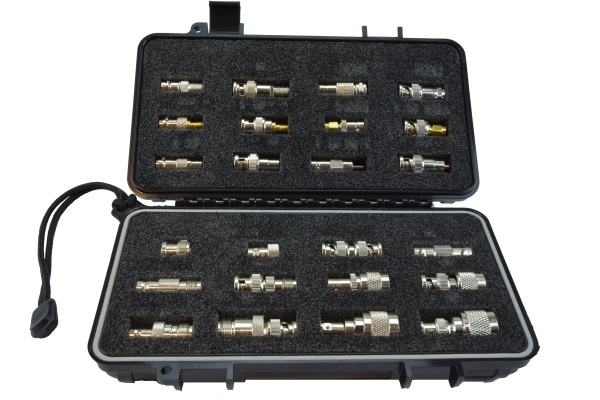 Our Precision BNC Adapter Kit offers direct high-bandwidth coupling for testing most coaxial cables and interconnects: BNC-BNC, N-N, SMA-SMA, BNC-N, SMA-BNC, SMA-N, and SMA-TNC. The kit comes in a rugged plastic case. 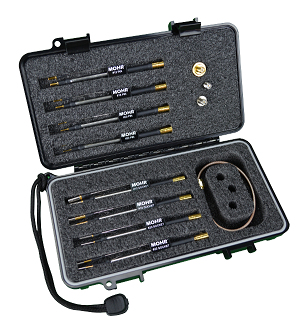 The CT100-AK-PSP Pin and Socket Probe Kit is the industry's only impedance matched pin and socket probe kit designed specifically for use with a high-resolution TDR. The kit components interface to a wide variety of military and commercial multi-conductor connector types. The minimal impedance change through the CT100-AK-PSP connectors preserves the ability to detect small flaws in the cable being tested. The CT100-DA-TRB Differential Test Set Adapter - TRB allows for low-loss differential TDR measurements to be made of MIL STD 1553B networks using the single port CT100B. The combination of a CT100B with the CT100-DA-TRB adapter will perform accurate, high resolution impedance measurements in installed 1553B systems. The adapter can be connected to either the main bus or to a stub, and the CT100B TDR signal will pass through multiple bus transformers to scan several cable segments at a time. 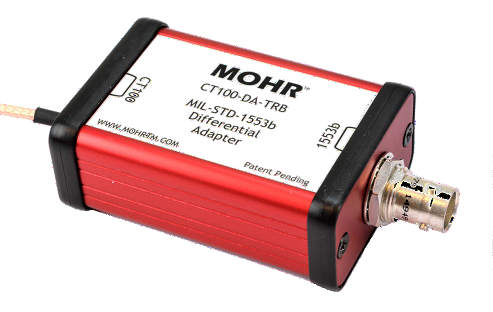 See the complete list of adapters and other accessories for the CT100 series of TDRs. MOHR Oil Field Drilling Mud System measurement probes provide real-time measurement of the oil/water ratios of drilling mud, along with the density and flow rate. 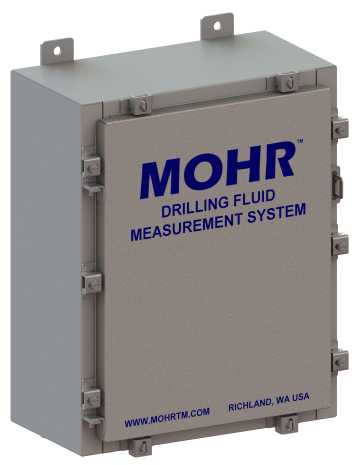 MOHR Oil Field Flow System measurement system provides real-time measurement of the oil, water and gas components of production flow streams, along with the flow rate. MOHR Oil Field Wet Gas System measurement system provides real-time measurement of the wet gas component of production flow streams, along with the flow rate. The MOHR systems are rugged, field reliable solutions that are easily integrated into any oil field operation. The systems do not require calibration in the field. The sensors require minimal maintenance. Panel-mount EFP-IL and portable EFP-HL signal processors. Meets all NRC Order EA-12-051 requirements for Spent Fuel Pool Instrumentation (SFPI). Precision remote water level measurement up to 1000 ft. from the pool. Accurate in boiling / frothing environments. Long life at elevated temperatures and pressures. Fruit penetrometers and texture analyzers give accurate, repeatable results. Tests interior portion of fruit as well as outer regions. Saves 50% or more of the time you spend testing. Also used for general materials testing.